As an architect for over 37 years and a contractor for over 33 years, I have continually been asked this question. 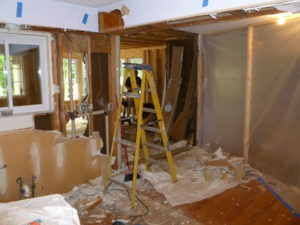 My quick answer is that it is always desirable from the contractor end to have the Homeowners away from the house while the project is going on. One reason for the homeowner to leave, for me as the contractor, is that I do not have to factor in major dust containment for set up and tear down each day. I can just install containment once at the beginning of the job and one teardown at the end. The next reason is that the workers do not need to do a major cleanup each day for their work. This normally involves allowing for 2 to 3 man hours of savings each day. Over the course of the job, that can equate to big savings that I can pass on to the Homeowners. Probably the biggest reason for the Homeowners to leave is dust. I can truly say I speak from experience on this one. I recently did some work at my home. My crews put up what I considered a very good containment around the work area. They also covered the ductwork and even shut down the furnace while major demolition was going on. The construction area was on the other end of my house from my Master Bedroom. Even with all the precautions, I would come home and find fine dust on my furniture and most importantly on my pillow case. Even though it was relatively a small amount I could still drag my finger across furniture and see an accumulation, or worse, lay my head on a pillow that had a very fine film of dust. Such is the nature of construction. Another reason to leave is inconvenience and disruption to your family’s daily routine. Any homeowner, especially one with kids, knows that the family runs on a certain timetable. When this timetable gets disrupted it is sometimes hard to adapt to a new one. Anything you can do to minimize the amount of time being in the house with construction going on will be for you, and your family, a good thing. Also in the long run it could save you a considerable amount of money. Here are some tips if you are going to move out that you need to do in preparation. Cover all furniture or appliances (especially electronics) with bed sheets (NOT PLASTIC). The reason for this is that plastic will just allow the dust to settle on top. When it comes time to remove you have to deal with dust being spread over the house again. Bed sheets will absorb the dust, then when you remove them you can put them in the washer and clean away the dust and the bed sheet all at one time. Box up and/or remove all breakables and especially “family heirlooms”. Change security codes in your house. If you like your existing code, then change it to a baby sitter code that you can give to the contractor. When the job is done you can then erase the code and keep your original. Forward phone answering and messaging. Arrange for pets or plants to be cared for. Make sure the contractor keeps a light on in the house at night at different times to make it appear as if someone is there. Stop by yourself from time to time to check to see if everything is OK. This is also important if there is an electric outage (for refrigerators and freezers). Also if there is a severe storm, check to see if you have any downed trees, branches, or shingles missing. Notify all regularly scheduled events of the change. ie.. lawn mowing, bug or termite treatment, lawn treatment, newspaper, or mail. Make sure your contractor gives you a timetable so you know when to start packing and when you will be able to move back in. If you follow all these tips, your remodeling experience will be a lot more enjoyable.